CAM, if treated secondarily to CAD, can yield opportunities for costly delays and production mistakes. Pro/ENGINEER Production Machining provides manufacturing engineers with robust NC programming capabilities for directly cutting and shaping product parts using milling, turning, and wire EDM. And, since it enjoys seamless compatibility with the design, changes are automatically incorporated. The result: improved time to production and customer responsiveness. Improve your manufacturing tooling and factory equipment design processes with Pro/ENGINEER Production Machining. Includes all the capabilities of prismatic and multi-surface milling. Supports CNC mills, 2-axis/4-axis CNC lathes, and 2-axis/4-axis CNC wire EDM machines. 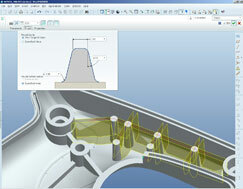 Provides low-level NC sequence editing, allowing precise toolpath control and optimization. Detailed step-by-step production planning instructions improves manufacturing efficiency, and reduces development cost.